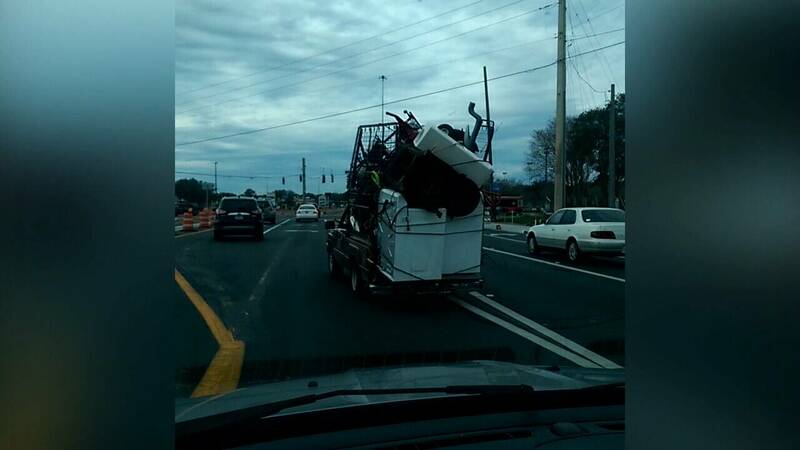 JACKSONVILLE, Fla. - A photo sent to the I-TEAM by a viewer concerned about driver safety triggers our investigation into a truck overflowing with dangerous cargo. We discovered the same small, burgundy-colored pickup with gold stripe on the side driving day-after-day weighed down with so much metal cargo the tailgate looked as if it was close to hitting the pavement and we could only see a handful of ropes being used to secure several appliances and other items made of metal. "Every time he switched lanes, he would almost hit people," described Kelvin Carthon who said the driver of the truck nearly ran him off the road as he drove west on Atlantic Boulevard in front of Regency Square Mall. 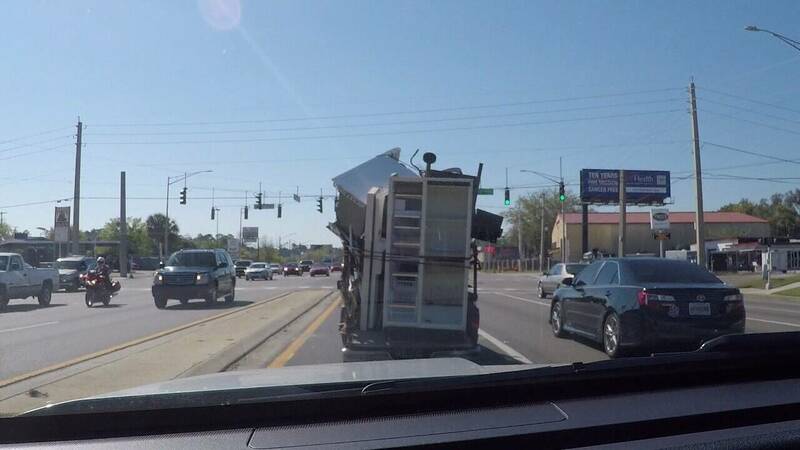 "The way the cargo was strapped down, didn't look very secure. Someone's going to get hurt. A car's going to get damaged." 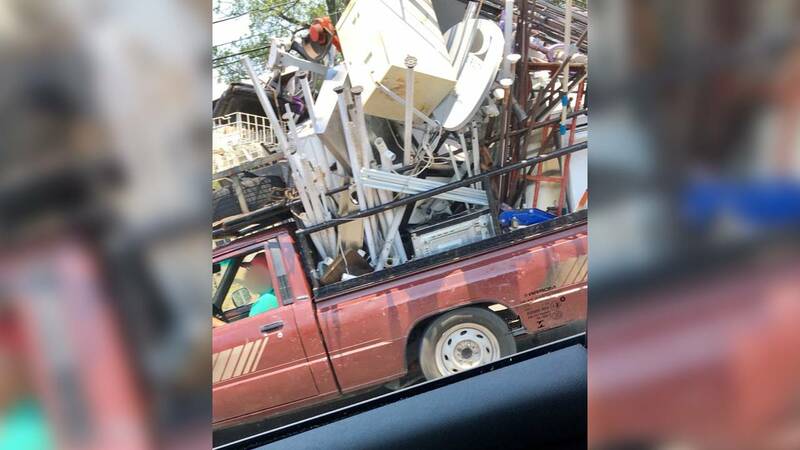 Carthon recorded video of the truck, which appears to have a washer and dryer balancing on its tailgate, a water softener, two metal bed springs, chairs, and so many other pieces of metal it's impossible to see all of it. 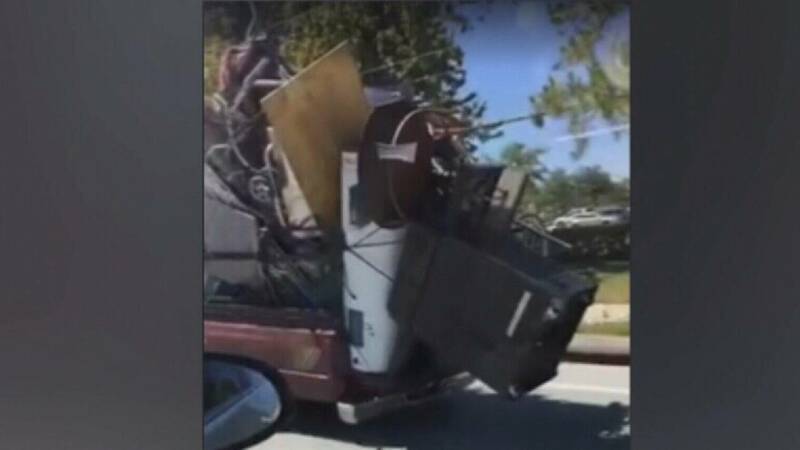 Another day, the I-TEAM spots the same pickup on Beach Boulevard with a refrigerator balancing on the tailgate and a washing machine teetering on top of a large heap of metal. The truck eventually pulls into a scrap yard on Philips Highway. 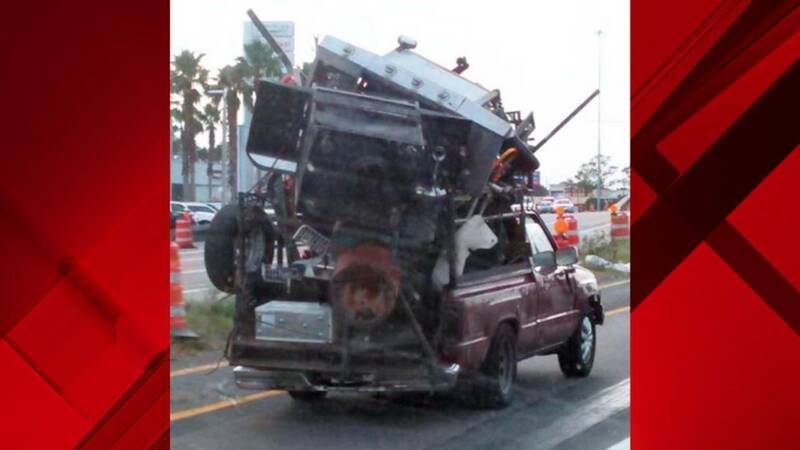 "Wow, unbelievable," said Florida Highway Patrol Sgt. Dylan Bryan when we showed him the video we recorded. "That was probably the worst case that I've ever seen of someone carrying debris that is not properly secured." Bryan lists off the traffic violations he sees in the video, which includes, license plate tag not visible, rear lights not visible, exceeding the maximum weight limit of the vehicle and careless driving. Bryan said the driver's view is obstructed making it difficult to see the other cars on the road. We found the driver outside a Southside apartment community. 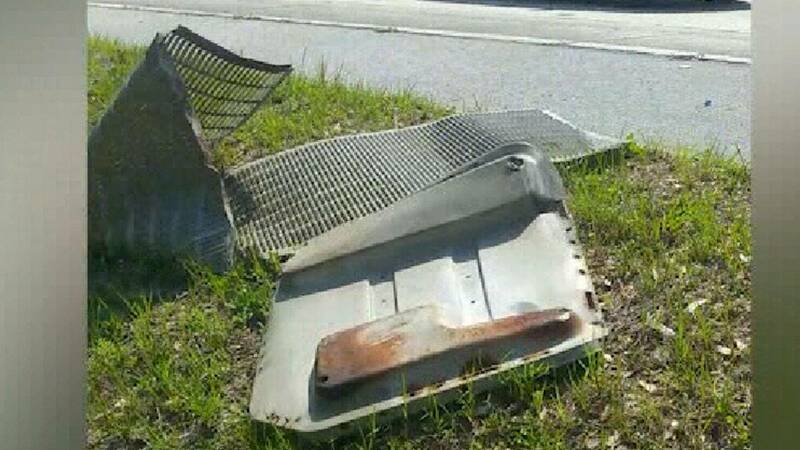 Again, his pickup was overflowing with pieces of sharp metal. 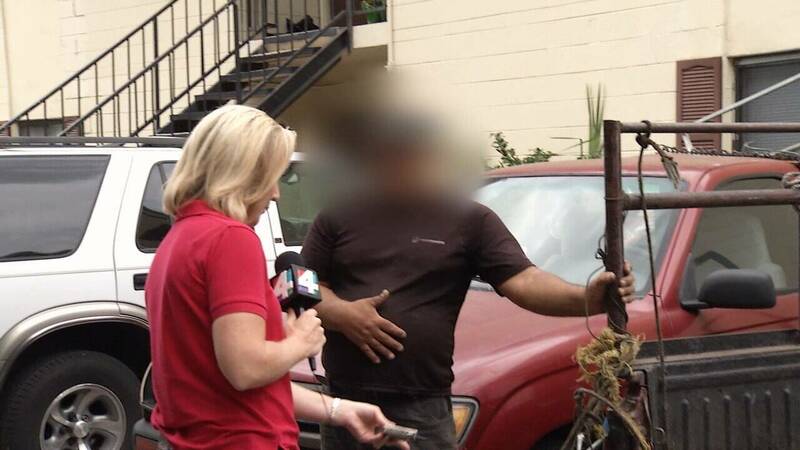 He told us he doesn't speak English and was not able to answer our questions about safety. He referred us to his wife, who did not want to speak with us on camera but answered a few of our questions through her apartment window. She said she and her husband moved to Jacksonville three years ago from Puerto Rico and that her husband sells metal to put food on their table. She said he has never been ticketed by police for driving with large loads of cargo, so they don't think they are doing anything wrong. She assured me he would buy, "another strap" and be more careful. Florida law requires a nylon strap be used to secure each piece of cargo that extends from the back. We do not see each secured with anything and the straps we do observe are rope, not nylon. Sgt. 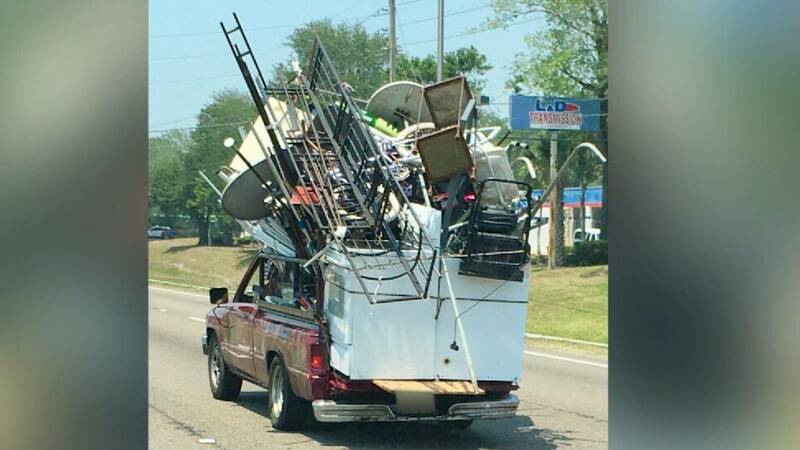 Bryan assured us, if any Florida Highway Patrol trooper sees the driver, with cargo that is not properly secured, he will be ticketed. "Oh my goodness," said Eunity Thornton who shook her head while watching our video. 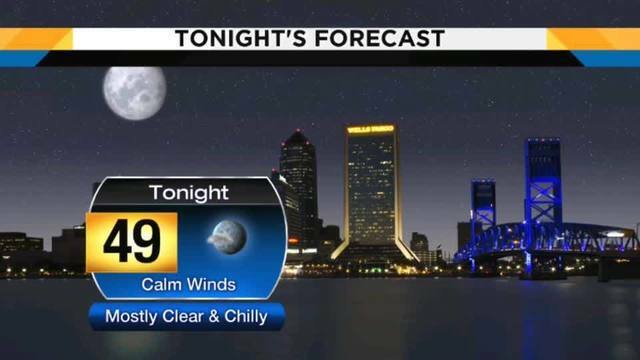 Thornton is still nervous driving on Jacksonville roads after she hit a steel A/C cage she believes dropped from a scrapper's car into the middle of the Hart Bridge Expressway as she drove home last year. "I swerved a little bit, but couldn't change lanes because a car was right next to me," said Thornton. She had no choice but to hit it. "There was actually a puncture hole right here where the bumper meets the fender. All the black undercarriage was ripped off," she said pointing to the right front side of her car. Thornton said it could have killed her if it had hit her windshield. She is still paying for it, too. It caused $2,644.91 damage, for which she had to pay a $500 deductible and her insurance increased nearly $60 a month. Thorton now uses the WAZE app to check for road hazards before she drives. A feature within the app allows other drivers to post the locations of road debris. 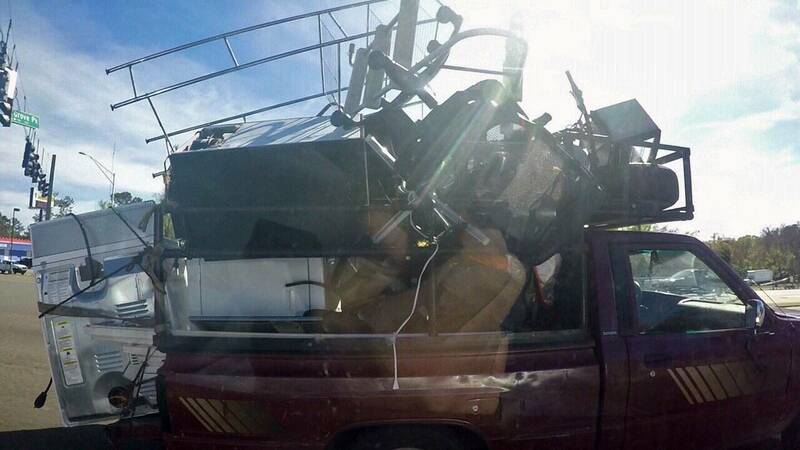 As a result of our story, more viewers sent us pictures and video of overloaded cars and trucks. 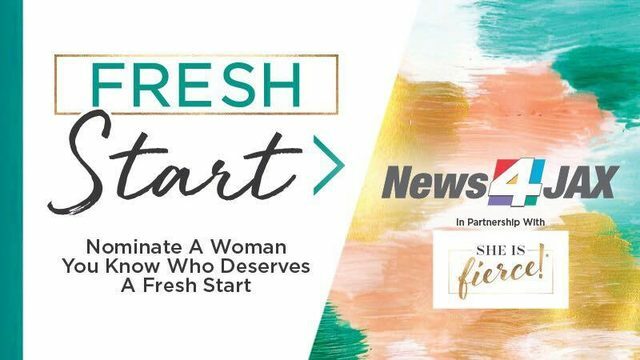 We were stunned to see nearly every one of them, is the same man we focused on in our story, who drives the burgundy-colored pickup truck with gold stripes on the side. The pictures were reportedly taken along Atlantic Boulevard between Girvin Road and Southside Boulevard. It is important to note it is not illegal to collect and/or sell certain kinds of metal. The purpose of our story is to help drivers stay safe on the road and to be aware of drivers who have been seen taking dangerous risks by not properly securing their cargo. We hope the information from our investigation will help you protect yourself and your family as you drive.